Here are some FAQs for users. If you have any other questions or advice, please feel free to go to our forum in the feedback page. NoxInfluencer is a statistics website tool that allows you to track Youtube channel statistics and measure channel growth on Youtube. We welcomed everyone to join and use our platform for free! Our platform support nine languages, such as English, Mandarin, Spanish, Vietnamese, Thai, Portuguese, Indonesian, Korean, Japanese. We are always in the process of improvement, and soon we will add other languages too. If you are YouTuber, join us an Influencer and work with hundreds of brands and agencies and get sponsored cooperation. Earn money and get hired today! If you are looking for influencers, join as a BRAND & AGENCIES. Free to find ideal audiences for your products. Over 2M influencers are ready to work with you. Start a campaign today! Please read the introduction of the tools down below. Best YouTube top lists will keep you always stay ahead. We provide daily / weekly / monthly ranking of Top YouTube channels by different categories and countries. It can’t be easier to find a YouTube channel with the fastest growing, which channel has been more unsubscribed or others you might be interested. You can find the most viewed and best video performance on YouTube. Find top videos you like in any Country or Category. Bookmark NoxInfluencer YouTube Video Rank, you’ll never miss anything about trends. How Channel Tools can help? Enter in a channel name or keywords on Youtube you want to track. For example, PewDiePie or T-Series etc. Secondly, you can use the filter as you prefer, by Category, Subscribers, Country, Est. Exposure, Last published date. We support multiple choice, don’t you think it’s much convenient even than YouTube, lol. 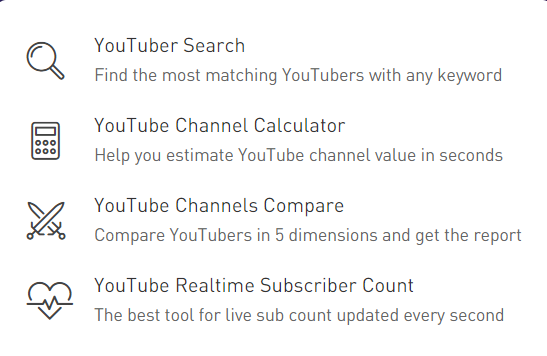 Channel calculator comes to provide you with the overview about a channel, just put the channel URL in the search box, and it will show you the channel’s statistic, including total subscribers, total video views and estimate of the channel value. – Video updated frequency: Video upload frequency in the past 30 days. – Video performance: Statistic of video rendering quality in recent 3 months. – Interaction rate: Average interaction of the audience each video. – Social media abundance: Number of social media channel has linked to. Allow you to check YouTube subscriber count in real time. It updates every second. Put the channel name or URL into the search box and see the live count. The tool will help you calculate the estimated earnings from any YouTube channel easily. It based on your video view count, engagement rate and other factors. Just put the channel/video URL in the search box, and it will show you video analytics report. This tool will help brands/companies always be in the know with their cooperations on YouTube. All you need it to create your video tracking task. Whether you have cooperated with influencers, or you have updating content. You can efficiently manage them on our platform. Everything is in your control. We’ll help you collect content performance for 30 days and up to 180 days’ status monitoring once you’ve created the task. You will always be the first one to know. If you want to join us as an Influencer, there is some information for you down below. >> How To Connect YouTube / Facebook / Twitter Accounts On NoxInfluencer? NoxInfluencer allows influencers to sign up with YouTube (Facebook / Twitter will supported soon) channels. It’s easy to connect with your social channels and start. 1. You can only connect one account per each social channel. For example, you could have one YouTube account to link your NoxInfluencer account. 2. Nox encourage influencers to fill in other social channels when you finish sign up. More channels may bring you more attention. >> What types of campaigns can I apply? We have two types of campaigns now. One is NoxInfluencer official campaign, and all the influencers can apply it. The other one is created by brand for influencers who have over 5,000 subscribers to ask for cooperation. Bid fees are how much you want to charge a brand for the content you create. Budget means how much a brand want to pay for the content. That might be a scope. Your bid fees could be higher or lower than a brand’s budget. Just remember that always bid appropriately to your channel size or the effect of your content. Brands will set deadlines when they create campaigns. You could bid and try to get the proposal before it expired. And finish contents on time. >> What can A Brand see about my profile? >> How Do I Know If My Proposal Was Accepted? When your proposal accepts by brand, an acceptance email will send to you. You need to negotiate with the brands about the proper terms of payment. Then you can start your creation! >> How To Make Your Proposals Accepted More? All about fit. It’s essential for a brand to find reasonable influencers to create content. For example, if a brand wants to promote a new mobile game, he is more likely to choose a Game Channel Influencer, not a Makeup Blogger. The cosmetics company will choose Makeup Bloggers to popularise their new lipstick, not a Game Channel Influencer as well. Think more when you prepare to bid. It could be flexible and reasonable. Such as subscription number, daily CPV for a brand (Cost per View), quality of your content (It will take more time and energy to create high-quality content) etc. You could manage your time and make proper content delivery time for both brands and yourself. A successful proposal will always include more benefits or services you will provide. Such as your plan for creating content, channels of communication, your audience etc. >> What Should I Do When I Informed To Start Creating Content? When you prepare to start your content, we suggest you click Start Creating Content button. You should click upload Preview YouTube Content after upload content on YouTube. After brands approved the content, you could release the content and complete cooperation! >> How Could I Get Paid? We wish each influencer get paid quicker than other platforms in the business. Before you start, we suggest you fill in Your Payment Info in “My Wallet” (PayPal is available now. We will support more payout options soon). You are free to negotiate with the brands about the proper terms of payment. Please make sure that PayPal email address you filled in is correct. We will settle in US dollar currency. You could change your PayPal email address in your Nox account at any time. Any US influencer using NoxInfluencer that makes over $600 throughout a calendar year will be required to fill out a W-9 form. Other international influencers are no need to fill out a W-9 but will have to declare they are not a US citizen during the Payment Info process. Please note: NoxInfluencer does not withhold any taxes from funds received on Nox. Please consult a tax professional for advice and tax obligations. NoxInfluencer is required by law to report any payments made over $600 throughout a calendar year to the IRS. As such, all US influencers who make over $600 on Nox are required to fill out a W-9. The W-9 collects necessary information such as Name, Address and Social Security number of the persons who received payment. 1099 is the tax form that will send you that will give you details on how much you paid throughout the year from Nox. 1099’s are sent out by the end of January. Please note this form is only sent to US taxpayers. NoxInfluencer does not give any tax advice. Please consult a tax professional for advice.